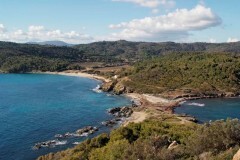 The path from Escalet to the “Cap Taillat” leads through a nature reserve along the coast and its bizarre stone formations. 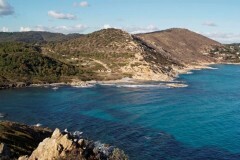 The length of the hike depends upon including the Cap Cartaya into the Cap Taillat or not. The route to get there goes through Ste Maxime, La Foux, St. Tropez and the Route des plages (D93), which branches off on the right side of the traffic light in St. Tropez. After the branch-off to Ramatuelle (on the right side) comes a branch off on the left to Escalet. Opposite to the beach in Escalet lies a car park.